For the American basketball player, see Max Landis (basketball). 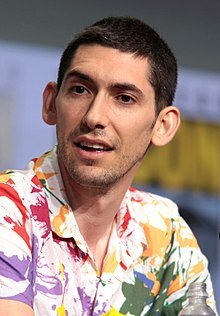 Max Landis ( /ˈlændɪs/ ; born August 3, 1985) is an American screenwriter, director, producer, and comic book writer who wrote the films Chronicle (2012), American Ultra (2015), Victor Frankenstein (2015), and Bright (2017), as well as a variety of short films including The Death and Return of Superman and Wrestling Isn't Wrestling . He was an executive producer on the Syfy anthology horror series Channel Zero , as well as creator and showrunner for the American adaptation of Douglas Adams' science fiction detective comedy novel series Dirk Gently's Holistic Detective Agency on BBC America, which both premiered in October 2016. Chronicle is a 2012 American found footage superhero science-fiction thriller film directed by Josh Trank and written by Max Landis based on a story by both. It follows three Seattle high school seniors, bullied Andrew ; his cousin Matt ; and more popular Steve — who form a bond after gaining telekinetic powers from an unknown crystalline object found underground. 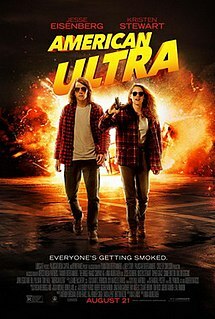 American Ultra is a 2015 American action comedy film directed by Nima Nourizadeh and written by Max Landis. The film stars Jesse Eisenberg, Kristen Stewart, Topher Grace, Connie Britton, Walton Goggins, John Leguizamo, Bill Pullman, and Tony Hale. It was released on August 21, 2015, by Lionsgate. 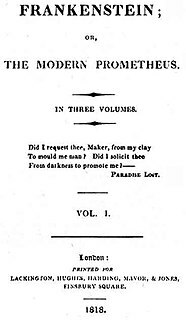 Victor Frankenstein is a 2015 American science fantasy horror film based on contemporary adaptations of Mary Shelley's 1818 novel Frankenstein. It is directed by Paul McGuigan and written by Max Landis, and stars James McAvoy as Victor Frankenstein and Daniel Radcliffe as Igor. The film was released by 20th Century Fox on November 25, 2015. John David Landis is an American film director, screenwriter, actor, and producer. He is best known for the comedy films that he has directed, such as National Lampoon's Animal House (1978), The Blues Brothers (1980), An American Werewolf in London (1981), Trading Places (1983), Three Amigos (1986), Coming to America (1988) and Beverly Hills Cop III (1994), and for directing Michael Jackson's music videos for "Thriller" (1983) and "Black or White" (1991). Deborah Nadoolman Landis is an American author, historian, professor, and costume designer. She worked on such notable films as Animal House, The Blues Brothers, Raiders of the Lost Ark and Three Amigos, all of which credited her as Deborah Nadoolman. Landis served two terms as president of the Costume Designers Guild of which she has been a member for more than thirty years. She is married to director John Landis; their son is screenwriter Max Landis. Masters of Horror is an American anthology television series created by director Mick Garris for the Showtime cable network. 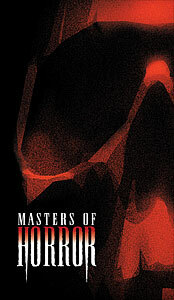 "Deer Woman" is the seventh episode of the first season of Masters of Horror. It originally aired in North America on December 9, 2005. Fear Itself is a horror/suspense anthology television series shot in the city of Edmonton, Alberta, Canada, with some additional shooting in the city of St. Albert and the town of Devon, Alberta. It began airing on June 5, 2008 on NBC. The University of Miami is a private, nonsectarian research university in Coral Gables, Florida, United States. As of 2018, the university enrolls 17,331 students in 12 separate colleges/schools, including the Leonard M. Miller School of Medicine in Miami's Health District, a law school on the main campus, and the Rosenstiel School of Marine and Atmospheric Science focused on the study of oceanography and atmospheric sciences on Virginia Key, with research facilities at the Richmond Facility in southern Miami-Dade County. A spec script, also known as a speculative screenplay, is a non-commissioned and unsolicited screenplay. It is usually written by a screenwriter who hopes to have the script optioned and eventually purchased by a producer, production company, or studio. John Andrew Davis is an American film producer and founder of Davis Entertainment. Roger Joseph Ebert was an American film critic, historian, journalist, screenwriter, and author. He was a film critic for the Chicago Sun-Times from 1967 until his death in 2013. In 1975, Ebert became the first film critic to win the Pulitzer Prize for Criticism. In 2012 Landis began work on his directorial debut Me Him Her . The film was released March 2016. 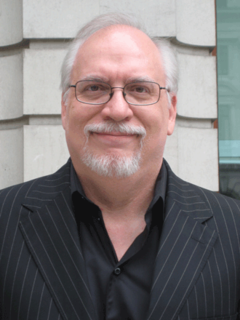 2005 Masters of Horror Yes 1 episode: "Deer Woman"
2009 Fear Itself Yes 1 episode: "Something with Bite"
2016 Honest Trailers Writer: "Batman v Superman: Dawn of Justice"
Joseph Michael Straczynski is an American television and film screenwriter, producer and director, and comic book writer. He is the founder of Studio JMS, and is best known as the creator of the science fiction television series Babylon 5 (1993–1998) and its spinoff Crusade (1999), as well as the series Jeremiah (2002–2004), and Sense8 (2015–2018). Development hell, development limbo, or production hell is media industry jargon for a film, video game, television program, screenplay, software application, concept, or idea that remains in development for an especially long time before it progresses to production, if it ever does. Projects in development hell are not officially cancelled, but work on them slows or stops. Logan's Run is a novel by William F. Nolan and George Clayton Johnson. Published in 1967, the novel depicts a dystopic ageist future society in which both population and the consumption of resources are maintained in equilibrium by requiring the death of everyone reaching the age of 21. The story follows the actions of Logan, a Sandman charged with enforcing the rule, as he tracks down and kills citizens who "run" from society's lethal demand—only to end up "running" himself. Robert James Thomas is an American author, producer, director and screenwriter. He is best known for creating the acclaimed television series Veronica Mars, and co-creating 90210 (2008–2013), Party Down (2009–2010), and iZombie (2015–present). Eric Andrew Heisserer is an American screenwriter and comic book writer. His screenplay for the film Arrival earned him a Best Adapted Screenplay nomination at the 89th Academy Awards in 2016. 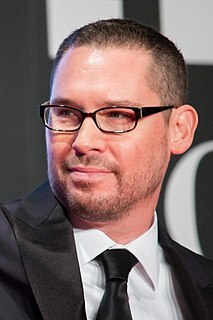 Bryan Jay Singer is an American director, producer and writer of film and television. He is the founder of Bad Hat Harry Productions and has produced or co-produced almost all of the films he has directed. Robert Schwentke is a German film director and screenwriter. X-Men is an American superhero film series based on the fictional superhero team of the same name, who originally appeared in a series of comic books created by Stan Lee and Jack Kirby and published by Marvel Comics. 20th Century Fox obtained the film rights to the characters in 1994, and after numerous drafts, Bryan Singer was hired to direct the first film, released in 2000, and its sequel, X2 (2003), while Brett Ratner directed X-Men: The Last Stand (2006). The DC Universe Animated Original Movies are direct-to-video film projects being created by Warner Premiere, Warner Bros. Animation, and DC Comics. These more recent movie projects have also included many of the voice actors who worked on previous DC animated series and films. Watchmen is a 2009 film based on the twelve-issue graphic novel series of the same name created by writer Alan Moore, artist Dave Gibbons, and colorist John Higgins, published by DC Comics between 1986 and 1987. The graphic novel's film rights were acquired by producer Lawrence Gordon in 1986. Many problems halted the adaptation's development, with four different studios and various directors and screenwriters being attached to the project through twenty years. In 2006, Zack Snyder, who at the time was filming 'another comic book adaptation', was hired by Warner Bros. to helm Watchmen. Filming started in 2007, and following deals with two of the previous companies involved in the development—Paramount Pictures was responsible for international distribution rights after budgetary issues in 2004, resulting in a lawsuit by 20th Century Fox. Fox, which was already contacted by Gordon in 1987, received $1 million of the gross—the Watchmen adaptation was finally released in March 2009. Will Beall is an American screenwriter and former Los Angeles Police Department detective. He is best known for writing the script for the films Gangster Squad (2013) and Aquaman (2018), and developing the TV series Training Day. Michael Alan Nelson is an American comic book writer and novelist. He is best known for the comic book and novel series Hexed, Supergirl comics, and co-writing the "Day Men" comics series. Nelson has written over 30 graphic novels. Wrestling Isn't Wrestling is a 2015 short film written and directed by Max Landis. Released for free on YouTube, the film retells the story of WWE professional wrestler Triple H. Like Landis's 2012 short The Death and Return of Superman, it consists of an unscripted monologue by Landis on the subject matter, accompanied by sequences with actors performing the parts in the story. ↑ "The Amazing Origin Story Of A Hollywood Wonder Boy Learning To Use His Powers For Good, Not Evil". BuzzFeed. Retrieved 14 April 2016. ↑ "Max Landis talking about screen-writing and Hollywood at Dubai Comic Con". YouTube. 2012-04-22. Retrieved 2012-11-06. ↑ "Back To Mysterious Island #1 – TPB (Issue)". 2014-02-02. Retrieved 2015-10-02. ↑ Dorothy Pomerantz (2011-12-19). "Max Landis, Screenwriter, 26". Forbes.com. Retrieved 2012-11-06. ↑ Tanya Thompson (2008-10-05). "Spotted On Site: Max Landis". The Miami Hurricane . Retrieved 2012-11-06. ↑ Sneider, Jeff (2011-02-08). "Max Landis on a spec-selling streak". Variety.com. Retrieved 2012-11-06. ↑ Sauriol, Patrick (2010-12-15). "The Black List of 2010 – Part 2". Coronacomingattractions.com. Retrieved 2012-11-06. ↑ McClintock, Pamela (August 11, 2010). "Fox picks up Max Landis' 'Chronicle' script". Variety . ↑ Kelly, Tim (2010-08-26). "Max Landis sets the record straight on his movie Chronicle". Chud.com. Retrieved 2012-11-06. ↑ "Chronicle". Rotten Tomatoes. Retrieved 2012-11-06. ↑ "Chronicle". Rogerebert.suntimes.com. 2012-02-01. Retrieved 2012-11-06. ↑ Downey, Ryan J. 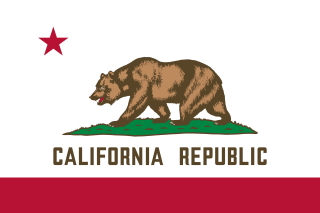 (2012-02-06). "'Chronicle' Makes Fourth Highest Super Bowl Debut". Mtv.com. Retrieved 2012-11-06. ↑ "Chronicle". Box Office Mojo. 2012-06-07. Retrieved 2012-11-06. ↑ Brooks, Brian. "Max Landis Set To Write 'Chronicle 2' For Fox". Deadline.com. Retrieved 2012-11-06. ↑ Fox Isn't Happy With 'Chronicle' Sequel Script, John Landis Says, MTV (October 11, 2012). ↑ "Frankenstein Coming To Life for Fox". Hollywoodreporter.com. 2011-06-22. Retrieved 2012-11-06. ↑ "'Homeland's' Howard Gordon, 'Chronicle' Scribe Sell 'Superhero' Police Drama to Fox (Exclusive)". Hollywoodreporter.com. 2012-09-17. Retrieved 2012-11-06. ↑ "Drunk Comic Book History Chronicles". Aboutheroes.com. 2012-02-03. Retrieved 2012-11-06. ↑ "VOTD: Max Landis' 'The Death and Return of Superman'". 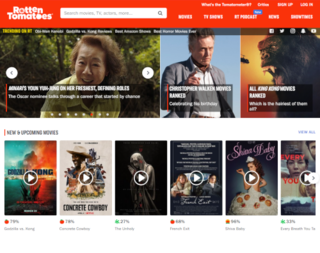 Slashfilm.com. 2012-02-04. Retrieved 2012-11-06. ↑ Armitage, Hugh (2012-11-06). "'Chronicle's Max Landis to direct sexual identity film 'Me Him Her' – Movies News". Digitalspy.com. Retrieved 2015-06-26. ↑ "Max Landis Sets His Directorial Debut in Indie Comedy 'Me Him Her'". FirstShowing.net. 2012-11-05. Retrieved 2015-06-26. ↑ "Max Landis Directing Me Him Her | Movie News | Empire". Empireonline.com. Retrieved 2015-06-26. ↑ "Max Landis' directing debut: 'Me Him Her'". Variety.com. 2012-11-05. Retrieved 2015-06-26. ↑ "Ariana Grande's 'One Last Time' Video Could Bring About The End Of The WORLD". Capital FM . Retrieved March 16, 2016. 1 2 Johnson, Mike. "Wrestling Isn't Wrestling – Screenwriter Max Landis produces ode to professional wrestling". pwinsider.com. Retrieved 22 July 2015. ↑ Martin, Adam. "Triple H comments on Max Landis wrestling parody". wrestleview.com. Retrieved 22 July 2015. ↑ "Former WWE personalities, independent wrestling stars, and celebrities appear in a short film profiling and parodying the career of Triple H". prowrestling.net. Retrieved 22 July 2015. ↑ "Max Landis Reveals He's a Consultant for WWE". 411MANIA. Retrieved 24 April 2017. ↑ Zakarin, Jordan (November 5, 2013). "The Amazing Origin Story Of A Hollywood Wonder Boy Learning To Use His Powers For Good, Not Evil". Buzzfeed. Retrieved January 2, 2019. 1 2 Menta, Anna. "SCREENWRITER MAX LANDIS SAYS HE'S 'SICK' OF FEMINIST MEDIA CALLING HIM SEXIST". Newsweek. Newsweek. Retrieved 5 January 2018. 1 2 3 Stern, Marlow. "'Bright' Screenwriter Max Landis Accused of Sexual Assault". The Daily Beast. The Daily Beast Company LLC. Retrieved 5 January 2018. 1 2 Riesman, Abraham. "Who's Afraid of Max Landis?". Vulture. New York Media LLC. Retrieved 5 January 2018. ↑ J. M. Baker, Katie. "Screenwriter Bro Just Might Be Hollywood's Biggest Fuckwit". Jezebel. 2017 Gizmodo Media Group. Retrieved 6 January 2018. ↑ Burwick, Kevin. "Max Landis Accused of Sexual Harassment by Multiple Women". MovieWeb. WATCHR Media Inc. Retrieved 14 January 2018. ↑ Freeman, Molly. "Sexual Assault Allegations Levied at Max Landis on Twitter". Screen Rant. Valnet. Retrieved 14 January 2018. ↑ Walsh, Shannon. "Max Landis: 5 Fast Facts You Need to Know". Heavy.com. Heavy Inc. Retrieved 14 January 2018. ↑ Hughes, William. "One of Max Landis' sexual assault accusers comes forward with more details". The A.V. Club . Retrieved 2019-03-02. ↑ Hipes, Patrick (2015-11-18). "'Channel Zero' Anthology Series Gets Greenlight From Syfy For 2-Season Run". Deadline. Retrieved 2016-10-08. ↑ Littleton, Cynthia (2016-01-08). "BBC America Gives Series Order to 'Dirk Gently's Holistic Detective Agency'". Variety. Retrieved 2016-10-08. ↑ @Uptomyknees (September 9, 2014). "MY #SCP! If you like it, please upvote! www.scp-wiki.net/scp-2137" (Tweet) – via Twitter. Wikimedia Commons has media related to Max Landis .